Nowadays, finding a residential property, and even a simple room to stay in can be a tough journey to go through for a tenant. However, not only tenants or property renters have concerns in looking for an available and suitable property, but also landlords and property owners who have to deal with fleeing tenants and vacant areas. The reason for this is due to the costs which can arise if a property will remain vacant for a month and more in maintaining it, as well as in the profit which will be gone once a tenant vacates. Nonetheless, the aforementioned incidents are unavoidable and the only step to take is to ensure that every person involved in the lease will be able to communicate to one another, especially when it comes to leasing terminations and eviction. What Is a 30-Day Notice to Vacate Form? A 30-day notice to vacate form is a document which is used by property owners and tenants regarding a property rental or lease. 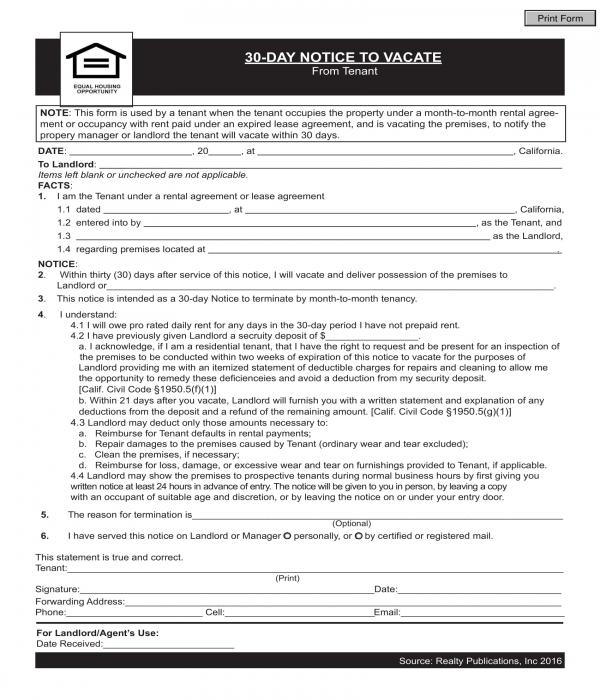 This notice form is intended to be sent by a landlord or property owner if he needs the tenant to vacate his property within a period of thirty days. On the other hand, a tenant can also use the notice form if he will have to move out of his rented property after thirty days due to job relocation and other reasons requiring the tenant to end his lease with the landlord. One of the known benefits of using and sending 30-day notice to vacate forms is that it will document the intents and the reasons why there is a need for a move-out to occur. This also will allow the landlord or whoever is sending the form to prepare the security deposit which was previously submitted or paid by the tenant as he started the lease. However, if there are any damages incurred in the property during the tenant’s lease period and residency, then the amount to be reimbursed to the tenant from his security deposit must be subtracted based on the cost of the damage and repair needed for the property. Step 1: Determine what format to use. There are several types of formats to choose from and each varies on how the form will be used by the end-user who is the tenant or the resident. When choosing the format, the size of the document must be considered as well especially if the form is intended to be printed out in order to hand it directly or physically to the tenant. Some of the formats to consider using include “.DOC”, “.PDF”, “.XLS”, and even “.ODT” depending on what software application is readily-available in the desktop or laptop of the document-preparer. Step 2: Allocate and create a header. The header will serve as the label of the document and the branding of the landlord or the property owner especially if the property is an establishment or a building that consist of a number of small apartments. The header must contain the title of the form at the topmost center portion of the document along with the logo of the property owner or his real estate property agency and the location of his office or his residential address. Other details to include in the header can be the contact information of the owner or the landlord and his electronic mailing address and website. Step 3: Make a section for identifying the tenant. This will be the first section of the form wherein the general information of the tenant will be disclosed such as his name and his address. Step 4: Add a statement for the purpose of the notice form. The statement must indicate the intent or the purpose of the landlord and owner of sending the 30-day notice form to the tenant which is specifically for evicting or requiring the tenant to move out of the property. The reasons why the tenant will have to vacate the property should also be defined in this section of the form along with the procedures to be followed ranging from the mandatory property inspection and the returning of the security deposit. Step 5: Incorporate a tenant signature block. This will be the last section of the form which should be able to have an area for the name and signature of the tenant as well as the date of when the tenant signed the notice form. In addition, a waiver of liability statement can also be added into the 30-day notice to vacate form to indicate the tenant’s waived rights in filing a lawsuit or any legal concerns regarding the eviction from the tenancy or lease agreement that he and the landlord both agreed and signed. 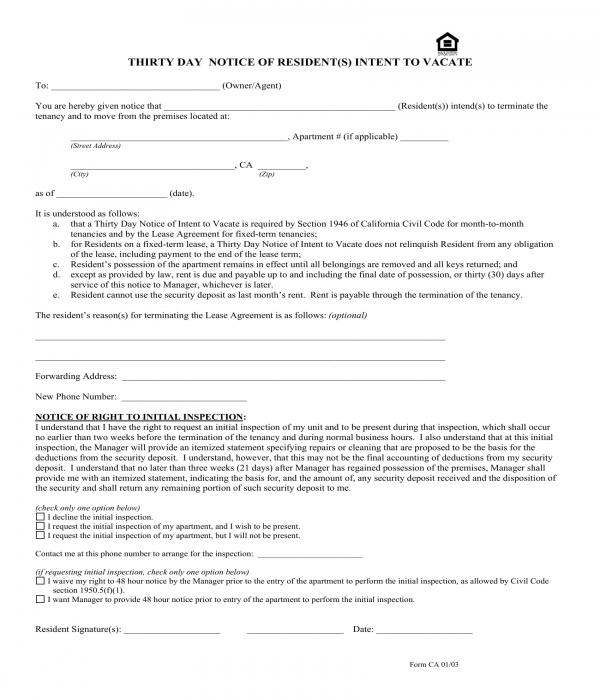 What is the difference between a 30-day notice to vacate form to a lease termination agreement form? Compared to a 30-day notice to vacate form, a lease termination agreement form is a long document which contains the list of terms and conditions, as well as payments which are agreed by the tenant, the landlord, and the property owner to be executed on the date that the lease will end. The agreement form will be provided to the tenant by the landlord after the notice is given to the landlord, and not the other way around. 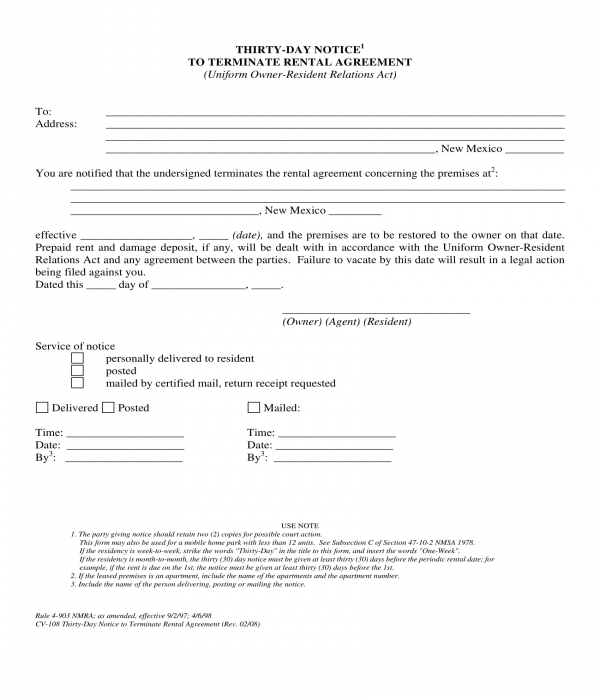 Moreover, the termination agreement form will settle any disputes and issues which may arise after the tenant vacates the property that he is leasing in. Is there a need for a 30-day notice form in a month-to-month lease? Yes. This is due to the importance of adequately informing the other party either about the departure of a tenant or the eviction of a lease from the landlord. Review the lease agreement or rental contract. Terminating a lease agreement must not be done based on the need of the tenant only, but should also be based on the agreement or the contract agreement which was formerly signed by him and the landlord. This means that when deciding on terminating the lease, the provisions and the clauses, especially the penalties, stated in the contract should be noted in order to avoid dealing with unexpected obligations such as paying additional charges due to not completing the lease period agreed by both parties. Elaborate the reasons. The purpose of using any type of lease form or document is to inform the involved parties. With this, it is essential that whatever the reason of the tenant in leaving the premises of the property and in terminating the lease, each must be enlisted and specified in the notice. Providing the reasons to the landlord can serve as a lesson to the landlord as well, especially if the reason is due to the concerns and issues which were not addressed by the landlord and property owner during the term of the lease. Add an extra day for the delivery. If the 30-day notice form is to be sent through a mailing carrier for property owners who are not living in the leased property, then a tenant must consider the possibilities that the notice may or may not arrive on the expected time or the starting day of the thirty-day period. On the other hand, it is more beneficial if the notice form will be given personally by the tenant to the landlord in order to have better communication and negotiations for the upcoming vacancy of the property. Lastly, a completed 30-day notice to vacate form must be photocopied or be duplicated. This is to ensure that every party involved in the lease or the rental agreement have their own copies of the signed and filled out notice form. The importance of having a duplicate on-hand can be observed when there are any legal preceding that will take place due to the negligence on one party about the subject of the notice.